I love to read, and I have consumed many (many!) books over the years in my spare time. In recent years, as a busy parent with a full-time career in science education, my genre of choice trends toward whatever interesting fiction titles I find on the “New Books” shelf of my local public library branches. I find the escapism and various perspectives on the human condition to be a pleasant antidote and much-needed break from thinking about science and the other demands on my time and energy. I also enjoy simply choosing from what’s in front of me–a rather motley assortment of new titles selected by the library staff to appeal to a wide range of patrons. I have found some real winners and a fair share of selections that didn’t quite hit the spot, but that’s been part of the adventure for me. As a teen, I was rather obsessed with historical fiction featuring female protagonists, and my own early appreciation of science was driven in part by the wisdom and awe for the universe imparted by Carl Sagan. So, I thought it would be interesting to read some nonfiction for once and connect those dormant interests with real life! I decided to (mostly) set aside my random novels for the winter and check out what sounded like a couple of interesting reads. I promptly put in a request for each title from my local library and waited for them to arrive. A few weeks of pondering and discussing these themes with family, friends, and coworkers had me primed and ready for “The Glass Universe,” by Dava Sobel. Here, I was transported back in history starting in the late 1800s, to the early days of the Harvard University Observatory. I learned of the collaborations among donors, astronomers, and institutions to obtain, process, catalog, and store huge amounts of images and data about stars obtained with telescopes around the world. Remarkably, many of the principle roles were held by women, in an early experiment in somewhat progressive and quasi-egalitarian participation by both sexes in the dogged pursuit of collective scientific knowledge. The book is itself something of a catalog of information, using correspondence, personal journals, professional society records, and the like to build a rather clinical chronology of participation and acheivement among a remarkable group of pioneering and adventurous scientists. The outcome of their efforts was a huge set of data (originally captured as images from telescopes on glass plates) that was carefully evaluated and protected by devoted scientists to build up human understanding of the universe around us. While reading each book, I was struck not only by the obvious shared themes of women in science, scientific funding and prioritization of projects, and astronomy, but also by the idea of data processing in general. In “Hidden Figures,” the massive amounts of mathematical calculations required in the early days of large-scale aerospace engineering projects were performed by large teams of people (the “calculator” jobs held in part by the black women in the story). When IBM mainframe computers were developed later on, these mathematical calculations could be performed much more quickly in a fraction of the time, which of course displaced the human calculators and brought an end to that era at NASA. Likewise, in “The Glass Universe,” astronomers used glass plates with photographic emulsions to capture nightly images of from a number of telescopes; these had to be evaulated by hand by the women (and men) in the story (including a staff of calculators), but also needed to be stored, protected, and managed in the long-term–no small feat for an underfunded academic observatory over many decades. (The first director was particularly concerned about the risk of fire!) Currently, the half a million or so glass plates are part of a digitization program to create computer images of each dataset (also no small feat). So what did I gain from my winter of reading about historical women in science? A broader appreciation of the social issues, the science, and the search for knowledge that has bound us together as a species through thick and thin. We humans never give up exploring our universe–from the farthest galaxies to the smallest particles, and individuals driven to explore can do amazing work when given an opportunity to acheive. It’s inspiring, it’s beautiful, and it’s humbling. It’s human, and it’s worth our time and effort. 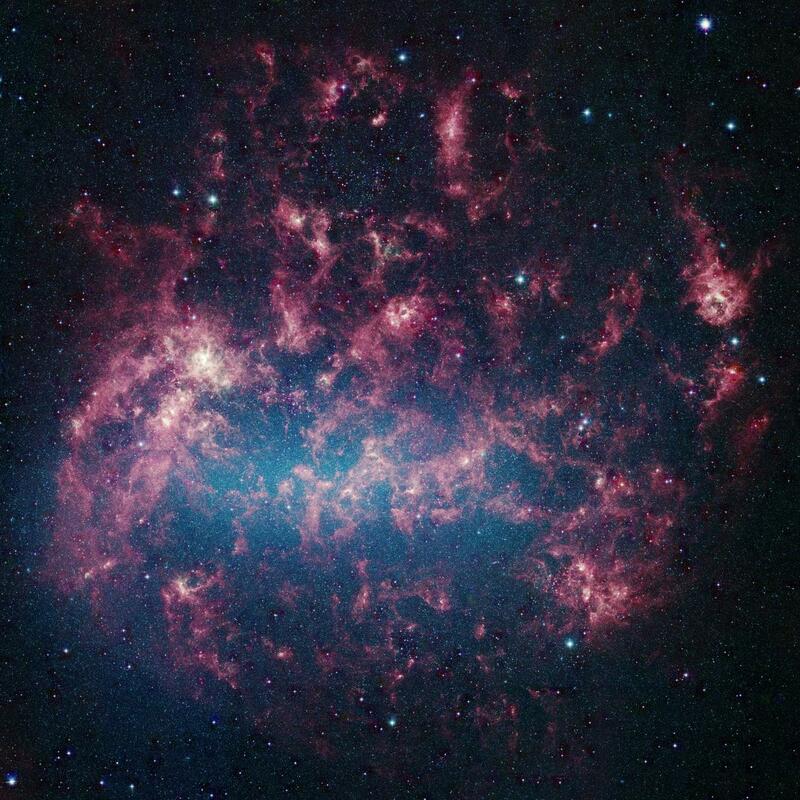 Large Magellanic Cloud image from the Spitzer Space Telescope, also once studied by the women of the Harvard Observatory. Image courtesy of NASA.